Thanksgiving used to be one of my favorite holidays. The reasons for this are numerous and obvious: there’s good food in abundance, there’s time to laugh and visit with family, there are exceptional movies being released in anticipation of awards season, and there’s pecan pie. Needless to say, any holiday with pecan pie has a special place in my heart. 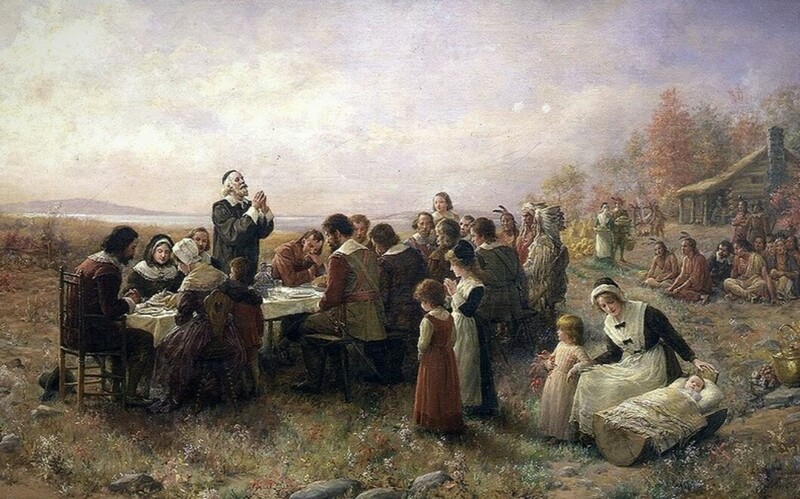 In addition I’m an avid aficionado of history and I love the Baroque era, during which the first recognized celebration of Thanksgiving took place at Plymouth Colony. But all of that belies the fact that Thanksgiving is also a celebration of genocide, which took place hundreds of years ago and which is still taking place today. This genocide is the ugly side of Thanksgiving and is frequently ignored by our culture for any number of reasons. These reasons are numerous but not so obvious, and they are rooted in events that took place hundreds of years ago and spanned thousands of miles. I can only begin to illustrate the depth of this history in one brief article, but I’ll do my best to condense the story and make it easily understood. The time was the early seventeenth century. Europe had been wracked by religious conflict for decades, revolving around the emergence of Protestantism and the resistance of Catholicism to any potential competitor for spiritual supremacy. These religious differences were primarily superficial but provided a thinly-veiled rationalization for the expansionism and colonialism of European monarchs who were quite frankly besotted with their own deification. 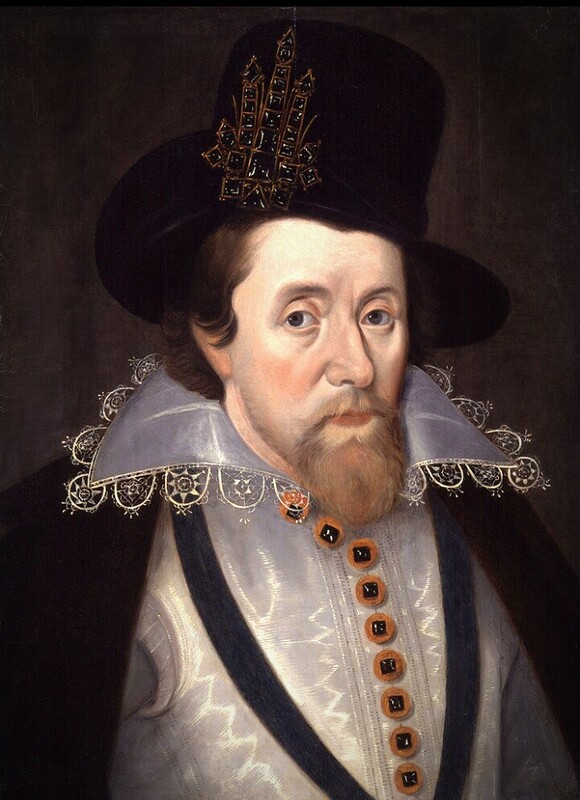 James I of England was one of these monarchs and never flinched from using his authority to persecute those whom he perceived to be religious dissidents. Separatists who wished for independence from the Anglican church formed one of these groups of dissidents, and it was persecution at the hands of James I that led them to emigrate from England. In 1609 these Separatists–who would later come to be known as Pilgrims–emigrated to the Netherlands. They were however unfamiliar with the culture in which they found themselves and became worried about the prospect of losing their identity in the fray of the rapidly industrializing city of Leiden. Events went from bad to worse when English authorities came to Leiden to arrest one of their number for writing comments critical of James I, and by 1619 these displaced Separatists were actively planning to emigrate once again. In this case, the Netherlands wasn’t far enough to escape James I. Only the distance provided by the Atlantic Ocean would satisfy their desire to be free of religious persecution at the hands of their own king. After a hazardous passage over forbidding seas, the Separatists landed on this continent in 1620 and established relations with local Native American peoples, including the Wampanoags and their chief Massasoit. There had previously been a wave of epidemics in the area, precipitated by the intrusion of European colonizers who were quick to exploit the rapid depopulation of entire communities. Some estimates indicate that as many as two-thirds of native people in the region of what is now New England died from infectious diseases introduced by Europeans. In any case the Separatists were not responsible for this, and Massasoit made no attempt to blame them for other people’s misdeeds. Consequently a peace treaty was signed in 1621, and there was a level of trust between the colonists and natives for a short time to come. Decades passed, and with time the number of Plymouth colonists increased. In 1621, the number of colonists was fifty. By 1630, the number had climbed to three hundred. By 1643, the number had skyrocketed to two thousand. Combined with the fact that colonists continued to acquire Wampanoag land at an alarming rate, there came to be increasing hostility between the natives and colonists. The Wampanoags had kept their end of the peace treaty of 1621, but increasingly the Separatists of Plymouth Colony were reneging on their end of the bargain. In the peace treaty, there had been an implicit understanding that the colonists would limit their numbers and would respect Wampanoag territorial sovereignty. This, however, was clearly not the case. By the 1660s, tension between colonists and natives was thick enough to cut with a knife. Massasoit had died in 1661, and his son Wamsutta succeeded to the position of supreme leader of the Wampanoags. Wamsutta had witnessed the collapse of the fur trade–by which his people had previously made a living–and had begun to resort to selling his people’s land to the Plymouth colonists. Doing commerce with the Wampanoags had by this time been made illegal, and Wamsutta was arrested by the governor of Plymouth Colony. After being administered a “portion of working physic,” Wamsutta was released from custody and died within three days. Proof was circumstantial, but it nonetheless pointed to the conclusion that the governor had ordered the poisoning of Wamsutta. 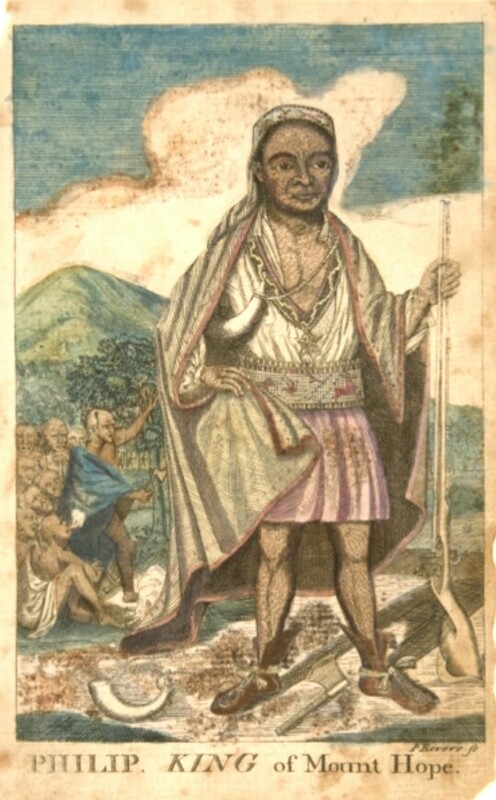 Wamsutta’s brother Metacom–who came to be known by the title of King Philip–then succeeded to the position of supreme leader of the Wampanoags. From the events of recent decades, Metacom had learned that the colonists were untrustworthy. They continued to encroach on Wampanoag lands and continued to deal with the Wampanoags unjustly. After a Christianized Indian had died under circumstances that may have been suicidal, three Wampanoags were hauled before a court in Plymouth colony, convicted on scant evidence, and promptly executed by hanging. The date of this hanging was June 8th, 1675. By June 20th, 1675, the Wampanoags were at war with Plymouth Colony. This war has been named Metacom’s War, though it could just as easily have been named the War of Territorial Acquisition or the War of Colonial Belligerence. In any case, it was a devastating event in Wampanoag history and resulted in the further decimation of their numbers. By 1676 the Wampanoags numbered no more than a thousand, while colonists in the whole of New England numbered eighty thousand. By the end of Metacom’s War, forty percent of the Wampanoag people had been killed. Of those few who remained, a great number were sold into slavery. By the early 1700s, the Wampanoag people had effectively been wiped out. This story would be awful in and of itself. It’s made worse, however, by the fact that what happened in the seventeenth century is still happening in the twenty-first century. Only now in place of a colonialist government seeking to steal native land, there’s a neocolonialist corporation seeking to despoil native land. Specifically Dakota Access, LLC, is in the process of desecrating land sacred to the Standing Rock Sioux of North Dakota. To make matters worse, Dakota Access is doing this for the express purpose of enlarging their own corporate profit margins, regardless of the consequences to anyone living downstream from the projected path of the Dakota Access Pipeline. This is bad for a few reasons: 1) the projected pipeline will be crossing the Missouri River, which is a major source of drinking water for many Midwestern states; 2) every pipeline has a significant risk of leakage; 3) the crude oil which will be transported is highly flammable and toxic; and 4) the Missouri then feeds into the Mississippi River. From this, you can see that the effect of the pipeline could be devastating for millions of people whose drinking water could easily be contaminated by fossil fuels in the near future. If there’s any consolation in all of this, it’s the fact that the Standing Rock Sioux have done their best to defend their land against this desecration by blocking access to certain projected construction sites for the pipeline; how long they’ll be able to continue this, however, is uncertain due to the persecution they’ve experienced at the hands of private security forces and law enforcement. So this is why I have mixed feelings about Thanksgiving. As much as I love the prospect of eating lots of delicious food with friends and family who enrich my life on a daily basis, I’m nonetheless torn by the realization that this entire celebration is built on the blood and pain wrought by centuries of genocide perpetrated against native peoples. It’s not a pleasant thought, and it doesn’t bring me any kind of happiness to dwell on it. Quite honestly there are times when I wish I could bury my head in the sand and forget about it. But that wouldn’t change the reality of what has happened and what is happening. On the contrary, it would be a betrayal of all that’s worth fighting for in this life. And if there’s one thing worth fighting for in this life, it’s the land we love.